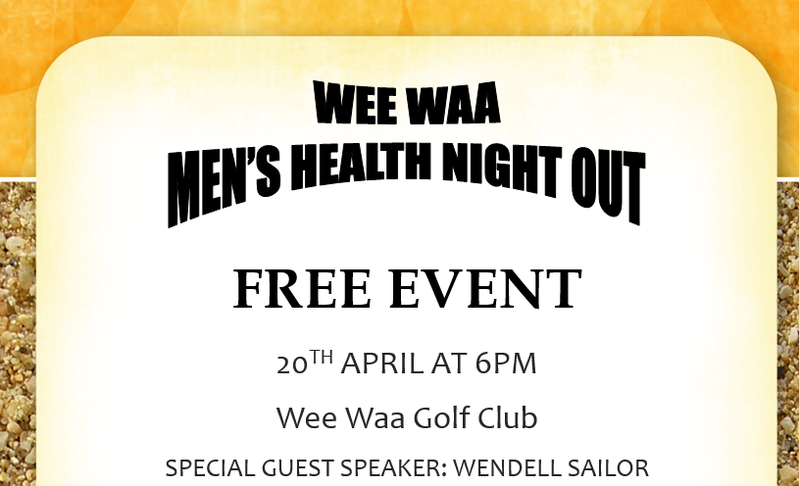 Men’s health information, honest communication and probably a little football are the topics at the Wee Waa Men’s Health Night Out on the 20th April. Organised by Hunter New England Health, and HealthWISE New England North West, this free event is hoping to reach out to some of the rural men in the area to seek information on their health and wellbeing with guest speaker football legend Wendell Sailor. Wendell Sailor is the guest speaker for the event, drawing from his own experience with health. Wendall was organized to speak at this event through KFactor, and the content of the talk will be a fun, interesting, personal take on mens health – with a bit of football thrown in. Men all around the globe live 5 years less than women, are often less willing to seek help and are more likely to keep putting off seeing a health specialist which can lead to a major health crisis. Men in rural and remote areas are also more susceptible to mental illness and depression, with male farmers experiencing higher suicide rates than the general population (source: beyondblue.org.au). Information on Men’s Health, with contacts, will be available at the night.